I submitted a shorter version of this op-ed to the Winnipeg Free Press on June 17, 2015, in response to Professor Joanne Boucher’s opinion piece entitled “Dress-code message at U of W sexist”. After this, the WFP published a response, “Pipe ceremony dress code uncalled for”, where Prof. Boucher was quoted once more, along with four men (any one of whom could’ve redirected media attention to an Indigenous woman). The voices of Indigenous women and Two-Spirits excluded on an issue that at its core impacts our bodies and our lives. We are the ones who face the consequences of these discussions, along with the backlash. Finally, rather than choosing to publish anything submitted by Indigenous women (or any of the many Indigenous women academics who speak publicly on ceremony and protocol), the Winnipeg Free Press published an editorial calling the whole thing a result of “identity politics”. The issue of protocol in ceremonies is not about “identity politics”, but about the right of Indigenous women to exercise self-determination. The title of my blog, “skirting the issue”, is attributed to Dr. Alex Wilson. 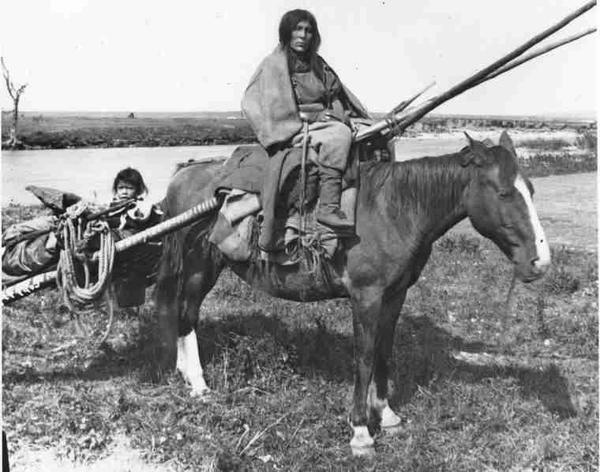 “Going Mobile: Cree woman with travois and child, around Saskatoon, C. 1900). Photo originally posted by Paul Seesequasis. In the context of Indigenous women, girls, and Two-Spirits facing staggering colonial violence, it’s crucial to challenge sexism in patriarchy in all of our communities – white and Indigenous. My objections to Professor Boucher’s argument are not to deny that ceremonial protocol forcing women to wear skirts is unacceptable (because it is) – it’s the claim that she was the first and only one to notice and speak up about it, and the attempt to remove ceremony from campus on the grounds that it is “religious”. As a Cree student at the University of Saskatchewan, I have been one of many Indigenous feminists across Canada involved in speaking up for ceremonial spaces that are inclusive for all genders and sexualities. I’ve felt empowered to speak out thanks to many strong Indigenous feminists around me, whose work is often erased, or dismissed as “non-traditional”. Indigenous women are still assumed to be passive and in need of “saving” from an archaic culture, and this is not at all the case. Indigenous communities are not a monolithic group. Many Indigenous women in the prairies choose to wear skirts to ceremony, and many do not. One of the lead organizers of Idle No More, Sylvia McAdam, joked that she tried to wear a long skirt while walking around in the thick Saskatchewan bush, and found it ridiculous rather than romantic. Last year, there was a similar opinion to Professor Boucher’s published in the University of Saskatchewan newspaper. Once again, it was by a non-Indigenous professor who had not visibly engaged with the on-campus Indigenous community, and once again, the person claimed that they were the only one to challenge the protocol. To call for the removal of Indigenous ceremonies from campus on the grounds that they are “religious” does not acknowledge the nature of ceremony or the ongoing history of attempts by Canada to eliminate Indigenous cultures and people. In an era where we are finally admitting that at least “cultural genocide” is a reality, it is nice to have the option as Indigenous students (even those of us who are agnostic/atheist) to take part in ceremonies in institutions where we still face daily racism and under-representation, especially for those of us in urban centers with few other spaces to access ceremony. Of course, ceremonies cannot be used in place of meaningful anti-racist curricular and policy change at educational institutions. Across Canada, pow wows and pipe ceremonies are tokenized, used in lieu of systematic change. Feathers are painted on school walls, as if this will counteract the hostility of facing classes, curriculum, peers, and teachers that stereotype and erase us. After discussions at the University of Saskatchewan campus led by Indigenous women and Two-Spirits, and particularly work on the part of Dr. Alex Wilson from Opaskwayak Cree Nation (who has written extensively on the issue of sexism in our communities), a groundbreaking anti-discrimination policy for inclusive ceremonies on campus was enacted. I hope that the University of Winnipeg will look into this and follow suit, because protocol is not “voluntary” when one is handed a skirt the moment they walk in the door, and shamed or cast out if they fail to comply. This issue is one of bodily self-determination and ending violence against Indigenous women and Two-Spirits. Ultimately, Professor Boucher and I agree that women should have the right to choose freely what to do with their bodies and clothing. For me, bodily self-determination also includes the right to participate in ceremonies that were stripped from my women ancestors (if I so choose), and to feel safe, not shamed while doing it. I acknowledge that Professor Boucher’s article inspired me to complete an article on this issue, and I hope that she, in turn, recognizes the privilege in her commentary on Indigenous women as an outsider being published Canada-wide, while Indigenous feminists have never had that platform. This is not a command for non-Indigenous women to be silent on violence against Indigenous women – in fact, we need you to stand with us, not in front of us, challenging colonial violence. I’m asking that those who want to be real allies to Indigenous women recognize the intersections of race, colonialism, and gender we face, and do not claim to speak for us. I am also against the backlash that women face for daring to speak out against patriarchal “tradition” based on values that colonial missionaries imposed on our cultures. This means implementation of policy, curriculum, governance, and ceremony that respects the bodily sovereignty of Indigenous women & Two-Spirits, while honoring the struggles of Indigenous women who bravely reject sexism today and the histories of Indigenous women fighting sexism since time immemorial.